What makes a brand do well with marketing on LinkedIn? In this case study, you’ll discover how different companies are using LinkedIn platform to engage their target audience. Nissan Motor Company Ltd, commonly abbreviated to Nissan, is a Japanese multinational automobile manufacturer. The company sells its cars under the Nissan, Infiniti, and Datsun brands with in-house performance change products labeled ‘Nismo’. Nissan motors wanted to create a targeted campaign to pitch its most popular car in India, The Nissan Sunny to ‘career changers’, a custom audience segment on LinkedIn. The success of this campaign was measured by the number of leads and requests for test drives generated from the target audience. Nissan Motor Corporation, used LinkedIn’s platform to reach out to correct the right set of people to test drive its most popular car in India – the Nissan Sunny. Nissan uses the InMail product, as it would allow Nissan to reach the desired target group and get an immediate response. Nissan Motor sent customized InMails on LinkedIn with a congratulatory note to the “Career Changers.” The message requested the Career Changer to test drive a Nissan Sunny, which they deserved as a reward for career success. “This proved to be an innovative platform to reach out specifically to professionals who had just taken a leap in their careers and were looking to upgrade their cars as well,” said Hideyuki Kuwayama, GM Marketing for Nissan Motor India. 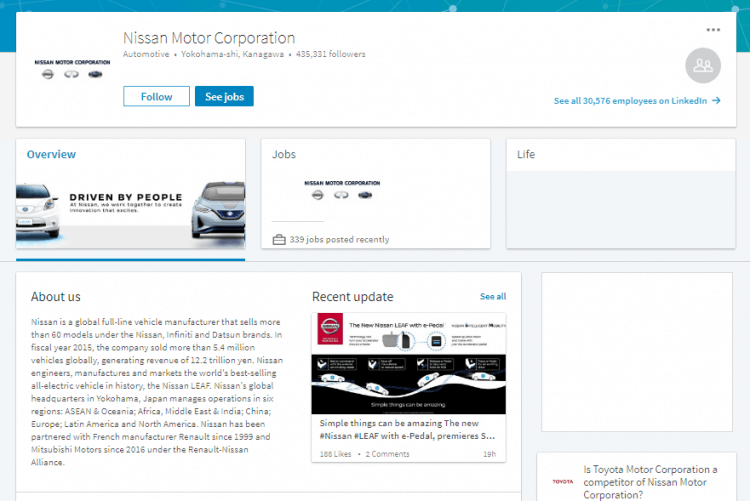 Nissan knows their audience and they deliver content on LinkedIn with informative and engaging content. It has grown quickly by sharing compelling content about topics relevant to products. The Walt Disney Company, generally known as Disney, is an American diversified multinational mass media and entertainment company. The mission of The Walt Disney Company is to be one of the world’s leading producers and providers of entertainment and information. 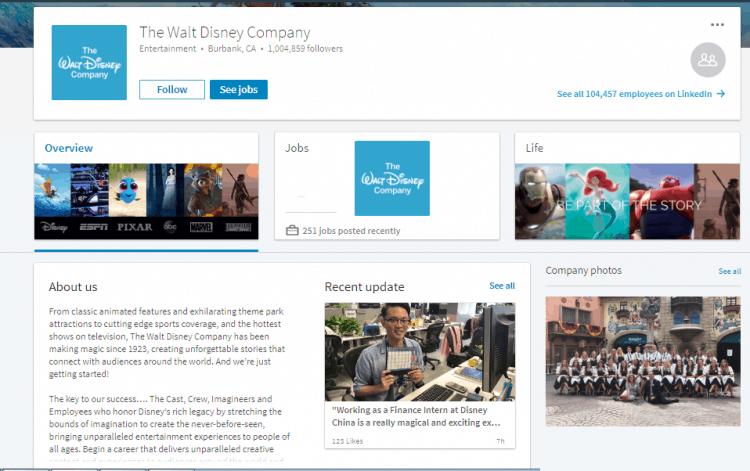 Disney has grown an engaged LinkedIn following. Now it has more than 1.0 million followers. It is one of the top brands on the platform. They share content that only LinkedIn audiences enjoy. You’ll find the content they share is mostly about their employees and the business side of Disney on their LinkedIn page. For example, in the article shared below, Klaus is working with Disney and he shared his experience. Disney shares employee testimonials on LinkedIn. Testimonials and case studies have always been influential in converting customers. Disney takes advantage of testimonials by posting exciting experiences from employees, like this one that includes a photo of a happy employee, and a quote from him. In addition to interesting employee quotes, Disney posts about the latest jobs available and shares tips, quotes and employee activities. Disney knows that building a social media marketing strategy for each social media platform is important. The content on Disney’s Facebook page or Instagram account is very different from the LinkedIn content. Their company promotes different content because the target audience is very different from LinkedIn there. Inc. magazine, founded in 1979 and based in New York City, is an American monthly publication focused on growing companies. This magazine is your monthly guide to running a successful business. Inc. Magazine helps the business owner and CEO, and their content redirects the C-level purpose. Everything from the simple efficiency hacks to complex data analysis is covered here. They also provide added room for their audience to share personalized knowledge. By actively managing and promoting their LinkedIn Company page Inc. Magazine has also attracted over 1.6 billion followers. With status updates posted every day, this generates a constant flow of engagement and new subscribers. The 100 days, 100 great questions campaign curated content provided by the Inc. audience and created new discussions. In this campaign, Inc. helps as the bridge between audiences– as they are now speaking to each other via the magazine’s Company Page. 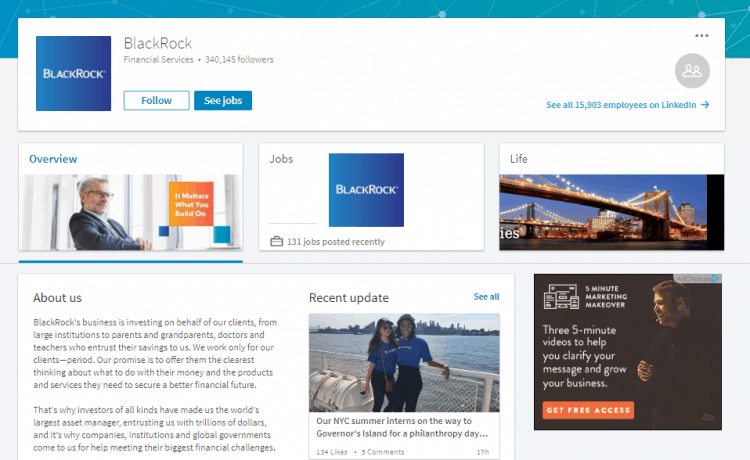 BlackRock’s LinkedIn page has more than 340K followers. It shares a lot of content about investment industry. Most of this content is from their own company blog. This strategy works because instead of sharing the same old content each person has written a thousand times, BlackRock focuses on advanced topics like non-traditional asset classes. BlackRock has a habit of creating content that their audience really needs instead of writing about the same old material. The company always makes sure that they share content on their LinkedIn page and groups. These brands are succeeding on LinkedIn. You can also achieve huge levels of success like them if you use established strategies and experiment with different content until you find what connects with your target audience. These brands share a lot of content in the form of videos, images, and links to blog posts. They also take steps to engage their employees via different campaigns. All of these approaches increase LinkedIn engagement and can help you build a stronger connection with your employees and clients.